What is the Raise the Roof campaign? Raise the Roof is a campaign to get a fair deal from the Treasury for people who choose to rent out a room in their home. The threshold of the Rent a Room Scheme hasn't been changed since 1997 and is drastically out of date. It currently stands at £4,250; the campaign would like to see this rise to a minimum £7,500 a year. Why should the income threshold be raised? The Rent a Room Scheme was set up in 1992 to encourage people to rent out rooms in their homes. It lets anyone taking in a lodger earn up to £4,250 in rent tax free. Since this amount was last increased in 1997 it hasn't changed, yet rents have risen dramatically. The average UK rent for rooms let to a lodger is £5,593 (£7,667 in London, where demand for shared accommodation is highest) an increase of 103% since 1997. 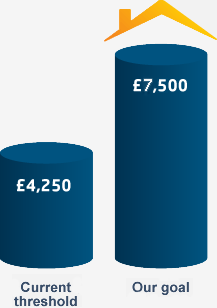 If the allowance had risen in line with inflation the threshold would now be at least £6,500. If the incentive doesn't reflect the current market it will stop being an incentive. We need people to keep letting out their rooms. Renting out a room is the single most effective way for homeowners to generate extra income and deal with the current cost of living crisis. It also helps combat the threat of repossession. There simply aren't enough properties available in the UK. More people renting out rooms means a supply of affordable accommodation, largely for the younger generation, but also for the increasing number of 40- and even 50-somethings who can't afford to rent on their own. With ownership drifting out of the reach of millions we have to provide suitable, affordable alternatives. Two people living together have a 40% lower carbon footprint (per person) than they would living separately; this rises to 59% for people sharing a 5 bed house. London and the South-East face acute shortages of affordable housing and businesses are struggling to recruit in these areas. Increased supply keeps rents down and enables people to live where jobs are being created. In 1968, our best year for housebuilding to date, we still only managed to add around 2% to housing stock. We're not building at anywhere near those levels today so the key (at least in the short term) isn't how many houses we build - it's how we use existing stock. 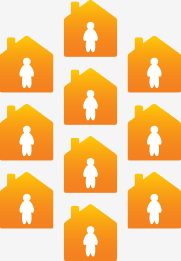 There are an estimated 19 million empty bedrooms in owner occupied properties in England alone. Under-occupancy amongst homeowners stands at 49%, compared to 10% in the social sector and 16% in the private rented sector. If we free up just a fraction of these rooms we'll have affordable accommodation for hundreds of thousands more people without having to lay a single brick. Who supports the Raise the Roof campaign? """As the cost of living rises and wages stagnate, high housing costs are stretching many family budgets to breaking point. For homeowners struggling to pay the mortgage each month, letting out a room to a lodger could provide them with a valuable source of income each month - but the threshold of the Rent a Room scheme needs an increase to make this an attractive option. Not only would this give renters more options, for some struggling homeowners it could make it easier to balance the bills.""" "There are thousands of people struggling to find somewhere to live near their work, and at the same time thousands of bedrooms are going spare. The government should do what it can to make it easier to let these rooms - that's why we're backing Raise the Roof." "The Rent-a-Room scheme is a great way to encourage households to make better use of their homes, removing the need to become involved with complicated and time consuming tax returns. However, it is completely undermined by the fact that the tax threshold for income from renting a room has remained unchanged since 1997. The decades since have seen a boom, two busts, and an enormous amount of change to the cost of living - yet no change to the rent-a-room threshold." "The average cost of renting a room home has doubled since 1997, it is about time that the tax system acknowledged this and made it easier for households to help ease the housing shortage." "At a time when housing is in short supply, it makes sense for the Government to incentivise homeowners to become live-in landlords and let out their spare rooms. It also helps homeowners deal with the cost of living crisis at a time when interest rates look set to rise. A more realistic threshold is long overdue." "I started out renting rooms in other people's houses. It helped me settle in a new area quickly when I took a job in Croydon and knew no one. It also meant I could save for a deposit on my first house. Since then I have rented out my spare room to others, but had to incur specialist tax advice as the rent was above £4,250. Raising the Roof would make it so much easier and I am sure this would benefit many future owners and renters tremendously." "Competition for high-quality, affordable places to rent is intense right now. More opportunities to rent a homeowner's spare room would be a great way to ease the pressure on the already stretched rental market. We support Raise the Roof, it's an excellent common-sense initiative." "This is a simple and expedient way to increase affordable accommodation which RLA fully supports." "We are not going to build our way out of a housing crisis overnight and therefore need a range of solutions that add homes, but also make best use of those we have now. Renting a room is a win-win, helping homeowners who may be struggling with their own housing costs and providing another person with a home. Government should do more to incentivise those who are looking to make best use of spare rooms and increasing the tax free threshold is long overdue." "It's crazy to think that there are 19,000,000 empty rooms in England alone, nearly double the population of London...with a huge housing shortage on. Not a day goes by without a headline referring to the housing shortage/crisis/disaster in our country and particularly in London. Making it easier to unlock these underutilised assets is clearly one of the most effective solutions for keeping landlords above water in terms of mortgages while also freeing up supply to respond to surging demand for homes." "Raising the threshold for the Rent a Room scheme is long overdue and the private rented sector is bursting at the seams. This simple measure would give a much needed boost to the availability of housing stock by providing homeowners with a meaningful incentive to access the untapped income from their spare rooms." "Anything that makes housing more affordable for consumers is a good thing. Renting a room within someone's home may be the safe and affordable solution that many are looking for." "It also allows struggling homeowners to utilise their spare rooms, providing income they may be reliant upon to pay their mortgage." "At a time when so many are priced out of housing, efforts should be poured in to providing affordable solutions such as increasing the threshold of the Rent a Room Scheme." We'll be adding further partners throughout the campaign as more people lend their support to Raise the Roof. SpareRoom is the UK's busiest flat and house share site, visited by 1.5 million people every month, and is in the top 500 websites for UK traffic. 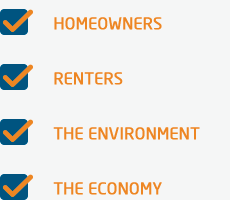 Since our launch in 2004 SpareRoom has been at the forefront of the online shared accommodation market. In the past 10 years we've helped hundreds of thousands of homeowners navigate the process of finding a lodger, as well as helping millions more people find their perfect flatmate or room to rent. 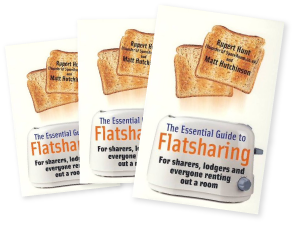 In June 2009 How To Books published 'The Essential Guide to Flatsharing' (now in its 3rd edition), written by two of SpareRoom's directors and collecting together 10 years' experience of dealing with shared accommodation.